DBIA is partnering with McGraw Hill Construction on a new study to analyze the impact of delivery systems on building projects. We would appreciate your thoughts and encourage you to participate in the online survey. The survey seeks to reveal the benefits, drivers and obstacles both of widely used delivery systems, including design-build and construction management at risk, as well as of emerging systems such as design-bid-build-operate-maintain. When complete, the results will be used to produce a Delivery Systems SmartMarket Report (SMR), which will be widely distributed to the U.S. design and construction community. Your responses will be completely confidential and used for this survey only. All responses will be analyzed in aggregate, and no individual responses will be referenced or used in any way. In appreciation for your time, those completing the survey will have the option to receive this exciting new report. The survey will take approximately 15 minutes; the deadline has been extended to this coming Monday, April 28. Thank you for sharing your insights. It is important that those who are practicing design-build get their experiences and opinions on record. If you have any trouble accessing the survey from the link above, please copy and paste https://mhcdodgesurveys.opinioninsight.com/survey/html.pro?ID=60&Q1=DBIA into your browser. The Design-Build Institute of America (DBIA) has released “Universally Applicable Best Practices Applying to Any Project Type, in Any Market Sector, of Any Size.” Based on research, case studies, and industry input, DBIA has identified design-build best practices. “The 10 Design-Build Done Right Best Practices serve as a single source that clearly defines design-build fundamentals to significantly enhance superior project outcomes,” says Lisa Washington, CAE, Executive Director/CEO, DBIA. Every day DBIA works with architects, engineers, contractors and owners who are experts and innovators in design-build project delivery. 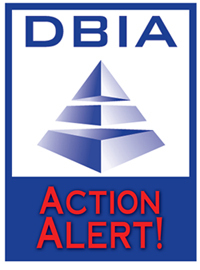 Industry leaders have worked with DBIA to advocate for, not just design-build, but Design-Build Done Right. When delivered correctly, design-build leads to some of the highest quality projects in the country, which is why DBIA has worked with these partners to educate lawmakers, private and public owners, and the entire A/E/C industry on the best ways to achieve that kind of success. A behind-the-scenes look will reveal that DBIA’s efforts to define, teach and promote best practices in design-build are just as integrated as design-build itself. Ahead of debate over a new highway funding bill this year, Reps. John Delaney, D-Md., and Mike Fitzpatrick, R-Pa., say Congress should use repatriated revenue to fill the Highway Trust Fund's coffers. In a letter to colleagues, Delaney and Fitzpatrick suggested using one-time revenues from repatriated earnings as a temporary means of funding the trust while negotiating a long-term solution. Repatriated revenue comes from transferring foreign earnings or returns on foreign investments. A survey conducted from May through June 2013 by the University of Arizona Office of Sustainability and published by the Natural Resources Defense Council (NRDC)* finds that more collegiate athletic teams are adopting green and sustainable practices in operation of their sports facilities. The goal of the survey was to identify sustainability initiatives implemented in college varsity, campus recreation, and club sports programs in the United States and Canada. Additionally, researchers were trying to determine which campus groups were primarily responsible for implementing green initiatives. The virtuoso choreography of Vikings stadium construction takes its direction at 6 a.m. daily from an unremarkable beige double-wide parked at the eastern edge of land where the Metrodome once stood in downtown Minneapolis. “You’ve got 1 o’clock tomorrow. Take it or leave it; then I’m going to move on,” Mortenson project manager Dave Mansell said when he stepped into the trailer one morning this week. He was informing colleagues of their window for a media event recently to watch the last of about 4,910 truckloads of Dome rubble roll off the site. Los Angeles County Metropolitan Transportation Authority (LACMTA) staff have recommended awarding a $927.2 million design/build contract to Regional Connector Constructors for the Regional Connector project, officials announced recently. Regional Connector Constructors is a joint venture between Skanska USA Civil West California District Inc. and Traylor Bros Inc. The 1.9-mile underground Regional Connector rail line will connect the Gold Line to the Blue and Expo lines, and allow trains to travel from Azusa to Long Beach, and from East Los Angeles to Santa Monica, according to LACMTA's blog. In the latest round of agreements for building its $2.3 billion integrated pipeline, the Tarrant Regional Water District board approved three contracts totaling $19.4 million. The district, which provides raw water to 98 percent of Tarrant County, is building the project in partnership with Dallas Water Utilities. The project will essentially double the amount of water that can be pumped to Tarrant County from the district’s Richland-Chambers and Cedar Creek reservoirs in East Texas. Recently, House Small Business Chairman Sam Graves, R-Mo., and Subcommittee on Contracting and Workforce Chairman Richard Hanna, R-N.Y., testified before a House Armed Services Committee hearing on the FY 2015 National Defense Authorization Act to request that the Committee’s bipartisan small business contracting reform legislation be included in this year's NDAA. If you make a big bet, go long on Texas. That's the idea behind a Dallas-to-Houston bullet train. The proposal isn't new, but paying for it with private dollars is priceless. And it’s the kind of all-in gamble we’re famous for. It’s OK to be skeptical. Lots of smart people are. Beyond reducing the number of uninsured Americans, the Affordable Care Act is driving new types of healthcare facilities, especially patient-centered medical homes. PCMHs are spaces that support a team-based approach to patient care, with physicians, nurse practitioners and some specialists operating under one roof – a one-stop shop for patients. Through this collaborative approach, PCMHs enable better patient care and improve the efficiency of delivery. New York transportation officials recently excluded the public from a second meeting about the future of Interstate 81 in Syracuse, showing four versions of a tunnel that could cost from $1.6 billion to $3.9 billion, according to a meeting participant. The overview was similar to what was discussed at another invitation-only meeting organized by the state Department of Transportation on the I-81 rebuild. McCarthy Building Companies, Inc., the largest general contractor in California with Northern California offices in San Francisco and Sacramento, is opening a Silicon Valley office, effective May 15. Located at2665 North First Street in San Jose, the office will offer greater accessibility to McCarthy’s Peninsula and South Bay clients, such as Stanford University and the Irvine Company, and strategically position the company in one of the country’s fastest-growing and most economically vibrant regions. CareerSpot is DBIA’s interactive career board that offers employers and career seekers an easy-to-use and highly-targeted resource for online employment connections. DBIA members receive a $100 discount on all 30-day job postings. Learn more about CareerSpot, here. Enrique Ivers, Student, California Polytechnic State University, Calif.
Steve Prange, Project Manager, Crawford, Murphy & Tilly, Inc., Mo. Thomas White, Principal, T. White Consulting, LLC, Va.
Ambrose Wong, Principal, Burkett & Wong Engineers, Calif.
New member listing as of April 14-20, 2014. Small Business Set-Aside: Mechanical Construction Services – various buildings – NREL Campus, Golden, Colo.
Presolicitation: Design/Build Soo Locks Approach Apron & Footbridge, Sault Ste. Marie, Mich.